There are many things to consider when choosing your shooting jacket. With so many options, many of which seem very similar, it can be a bit of bewildering choice. Here, in the first of 3 blogs on the subject of choosing the right jacket for you, we take a look at making that choice based on how much you want to spend. A day out game shooting may well cost you a lot of money and time. You don’t want to spend it being cold, wet and miserable, so it’s worth getting your clothing right. Feel around the seams over the shoulder, to be waterproof you should be able to feel tape underneath the joins, if it’s not taped, it’s probably going to leak. With wax and tweed garments look at the weave, both need to be very tightly woven if they are relying on the outer fabric to be waterproof. 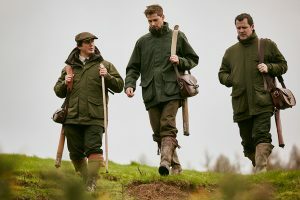 Moving to the entry-level branded products there is again a huge range to choose from; those widely available include the likes of Deerhunter, Seeland, Jack Pyke, Hoggs and Ridgeline. When buying a jacket from all of these brands you can expect change out of £200, and if you pick the right one on offer you could even get below £100. The level of detail, features and quality of construction of many of these is outwardly difficult to differentiate from the next step up in price. With many of them you’ll get everything you want in terms of pockets, hood, length, freedom of movement, weight, etc. It’s when you get into the technical details that the differences become clearer. One of the main drawbacks of an entry-level jacket is the level of breathability. A genuine Gore-Tex lining not only stops water going in, but allows sweat to wick out very quickly. Cheaper membranes now tend to be very good at keeping water out, however they still haven’t caught up with Gore-Tex on the breathing aspect, and you’ll find that cheaper membranes tend to be compromised on breathability. In this price range Seeland seem to have emerged from the pack as market leaders in recent years. We’ve found their products to be very well constructed and durable for the price, and sell their range with the same confidence we have for more expensive brands. Moving to the more mid-market brands, you’ve got some well-known names that have a deserved reputation for quality; including Laksen, Alan Paine, Barbour and Beretta. You’re generally looking between £200 – £350 for a jacket with these brands, that will be well designed and constructed with a combination of own-brand and branded fabrics. 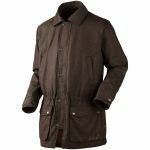 At this price point you can definitely get a totally reliably shooting jacket with the appropriate features for you – whether you’re looking for extra warmth or super-lightweight. I’m a particular fan of Alan Paine in this part of the market, especially their Compton Tweed range which represents great value for money. It’s well made, it looks the part in the smartest of shooting fields and the price doesn’t break the bank. At the very top end of the price range you only really have 3 names: Harkila, Musto and Schoffel. After that you’re into the bespoke market, where you’ll get perfect fit and a great look -generally with traditional tweed tailoring- but commonly not the technical performance fabrics featured by these 3 brands. 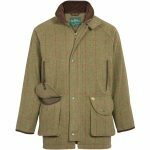 Harkila make about the best kit for stalking, but for driven game it’s a straight fight between Musto and Schoffel. Both use all the leading fabrics available including Gore-Tex, Primaloft and Polartec to make their jackets. Both have jackets suited to most conditions and personal preference on the weight and warmth. At up to £600 for a jacket they aren’t cheap, but what you get is a very smart, durable jacket that will do the job and stand the test of time. I’ve got a Musto Jacket that I’ve had for well over a decade, and it’s not looking like it’ll fail me anytime soon. So, there you have it, a very quick guide to choosing your shooting jacket by price range. In the next instalment of this 3-part series we’ll look at choosing your jacket by fabric. 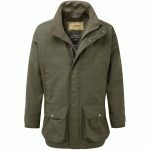 Alan Paine, barbour, barbour clothing, clothing, country clothes, Country Clothing, GORE-TEX, hereford, Herefordshire, Musto, Musto Shooting Jacket, Philip Morris, Philip Morris & Son, Philip Morris And Son, Sch?ffel, shooting, Shooting Accessories, Shooting Clothing, Shooting Jacket. Bookmark.